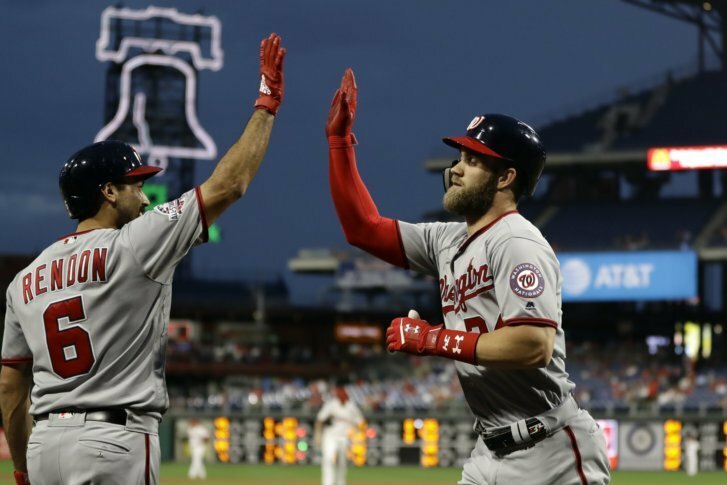 PHILADELPHIA (AP) — When Aaron Nola can’t stop Philadelphia’s skid, the Phillies are in trouble. “We haven’t played good baseball due to a ton of variables,” Phillies manager Gabe Kapler said. Nola, a Cy Young Award contender worthy of MVP consideration, had a rough first inning as the Phillies lost their fifth in a row to drop 7 1/2 games behind first-place Atlanta in the NL East with 17 to play. They’re 11-23 since Aug. 5, when they had the NL’s second-best record. Nola allowed four runs and six hits in five innings. His ERA rose to 2.42. He’s given up four runs twice in September after only doing it twice in his first 27 starts. Nola, Mets ace Jacob deGrom and Washington’s Max Scherzer are the front-runners in the NL Cy Young race. Scherzer has won the past two and previously won the award in the American League with Detroit in 2013. Harper crushed his 33rd homer, a two-run shot into Philadelphia’s bullpen in the first to give the Nationals a 2-0 lead. Anthony Rendon followed with a double and scored on Zimmerman’s single. “It’s reminiscent of watching Tony Gwynn growing up,” Strasburg said of Soto. J.P. Crawford hit a solo shot in the fifth for Philadelphia’s only run. Strasburg threw a pitch that hit Philadelphia’s Jorge Alfaro, bounced off his arm, hit catcher Matt Wieters on the side of his helmet and then glanced off the plate umpire’s mask. Nola became the first Phillies pitcher to reach 200 strikeouts in a season since Cliff Lee and Cole Hamels in 2013. The Nationals closed within a half-game of the Phillies for second place behind the Braves. Nationals: RHP Joe Ross makes his first start of the season Thursday in a makeup game against the Cubs. Phillies: RHP Zach Eflin (9-7, 4.42 ERA) pitches Friday night against Miami in the opener of a three-game series. Eflin is 1-0 with a 2.57 ERA in two starts vs. the Marlins this season.